Tendai Chatara claimed his career-best figures of 4/33, including the prized scalp of Thisara Perera, to script the victory for the minnows. Zimbabwe survived a Thisara Perera scare to beat Sri Lanka by 12 runs and secure their first victory in the tri-nation series Wednesday. 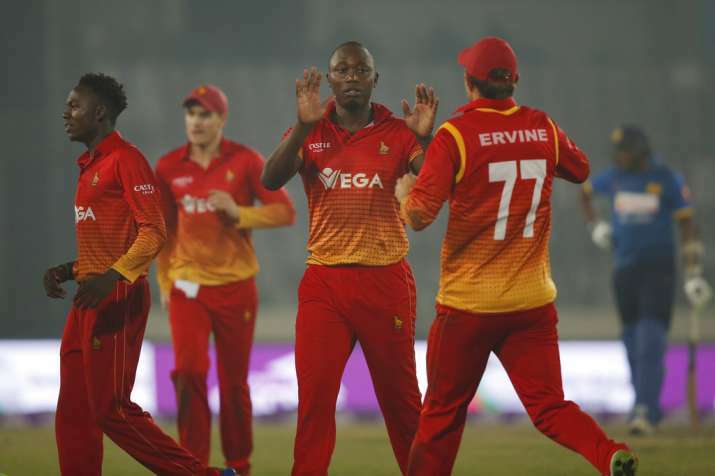 Tendai Chatara claimed his career best 4/33, including the prized scalp of Perera, to script the victory. Sikandar Raza steered Zimbabwe to a challenging 290/6, hitting a fluent 67 ball-81 not out. Sri Lanka was in a precarious situation with 181/5 in the 34th over but Perara brought victory into sight, smashing the ball to all corners of the park. Sikandar Raza however brought relief, removing K Perera, who hit eight fours and two sixes in his 80 off 83. Pace bowlers Blessing Muzurabani and Kyle Jarvis removed two seasoned batsmen, captain Angelo Mathews (42) and Dinesh Chandimal (34) respectively, in four overs as Zimbabwe sensed a victory. For Zimbabwe, Raza's half-century was studded with eight fours and one six, most of which came in the last powerplay to steer the side reach closer to 300. His free-hitting prowess helped the side gather 53 runs for the loss of just one wicket in the last five overs. Opener Hamilton Masakadza scored 73 off 83, hitting 10 fours. He and Solomon Mire (34) combined for a 75-run opening partnership in 13 overs to lay the platform after Sri Lanka captain Angelo Mathews's decision to bowl first. After a disastrous showing against Bangladesh, Zimbabwe's batsmen got the pitch to their liking with Masakadza leading the way. Gunaratne helped Sri Lanka hit back, dismissing Masakadza in the 28th over, but Raza stood firm. With the help of Brendan Taylor (38) and Malcolm Waller (34), Raza steadied the ship and helped the side post challenging total. Asela Gunaratne claimed 3/37 while Thisara Perera returned figures of 2/43.